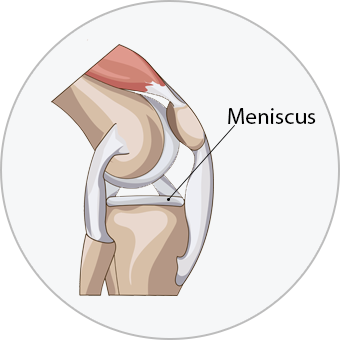 A meniscus tear is when one or both of the c-shaped pieces of cushioning cartilage in the knee joint rip, either across the meniscus horizontally, or along the meniscus vertically (known as a bucket handle tear). Tears are most often the result of twisting or wrenching the knee and are a common knee injury. A meniscus is a c-shaped rubbery disc of cartilage that acts as a cushion between the femur and the tibia bones. Each knee has two menisci (plural of meniscus) one on the outside of the knee (lateral meniscus) and one on the inside of the knee (medial meniscus). Symptoms usually go away in two to three weeks and include swelling and pain in the knee. A moderate tear will have pain at the side or centre of your knee, swelling that gets worse over two to three days. You may have stiffness in the knee and not be able to bend it fully. Symptoms may go away in a few weeks but will return if not treated. In severe cases, your knee may have a catching, popping, or locking sensation when you try to move it and your knee might feel unstable or wobby and you might not be able to fully straighten it. Simple at home remedies to treat a minor meniscus tear at home include resting the affected knee, reducing swelling with an ice pack and an elastic bandage for compression, and taking over the counter medication to reduce pain. Other treatment options include physiotherapy and in some severe cases surgery might be needed. After a meniscus tear your knee may feel unstable or wobbly and might give out while walking. Physiotherapy aims to stabilize the knee by strengthening the muscles around your knee. Will a Meniscus Tear go Away on its own? Yes, in some cases a meniscus tear will heal on its own. However, in the case of a severe meniscus tear, symptoms can go away, but continuously return if you do not get the proper treatment. Can you Prevent a Meniscus Tear?